The refugees are having to walk for days or even weeks just to cross the border. They have little or no food on this journey, and they sometimes need to hide from militia groups. They may escape the violence, but hunger is constantly with them. "Children who have survived the horror in the Central African Republic are now at risk of dying from malnutrition and its complications. Death is stalking these children. It is alarming to see entire families undernourished - including older children and women." The United Nations says about 1 in 3 children among the refugees are suffering from malnutrition. They are in an extremely weakened condition. Malnutrition will cause lasting physical and mental damage in children, or even death. Since January, UNICEF has been providing small children therapeutic food and milk to save their lives. However, the UN children's agency does not have all the required funds for its Cameroon mission. The UN World Food Programme (WFP) feeds children an enriched peanut paste called Plumpy'Sup. This food, along with Super Cereal, helps children fight off the potentially deadly malnutrition. The WFP can only have a supply of these life-saving foods through voluntary donations from the international community. There is just not enough funding right now with all the humanitarian emergencies taking place. We are experiencing the most refugees globally since World War II. Funding levels for hunger relief have to increase dramatically now to avoid starvation in Africa and the Middle East. Food pipeline breaks are already occurring in Uganda and other places. Refugees in Cameroon, especially children, will be the next to suffer because the world did not act timely enough. Gian Carlo Cirri of WFP says there is only enough food to last till September. No other funding has come in to refill the pipeline thereafter. 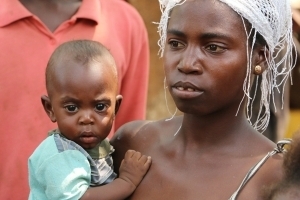 A massive hunger catastrophe is on the road ahead in Cameroon. "We need funding now. That's because it can take 4 months or more for a donation to be converted into food being handed out at a distribution site. That's especially true when you are talking about the nutrition products we need for the refugees (PlumpySup and SuperCereal)." The situation will only get worse with more refugees fleeing the Central African Republic. Penner adds, "we expect more to come. The situation inside CAR is not getting any better. We expect the number to reach 180,000 by year's end. It's currently at 106,000 since January." WFP has a fundraising campaign called CAR Can't Wait. We have to stay ahead of the famine in Africa. If we don't act now, lives will be lost. We have to make sure the pipeline of food remains flowing to people on the brink of starvation.